A World war has begun. Break the silence! The Obama administration has built more nuclear weapons, more nuclear warheads, more nuclear delivery systems, more nuclear factories. Nuclear warhead spending alone rose higher under Obama than under any American president. The cost over thirty years is more than $1 trillion. I have been filming in the Marshall Islands, which lie north of Australia, in the middle of the Pacific Ocean. Whenever I tell people where I have been, they ask, "Where is that?" If I offer a clue by referring to "Bikini", they say, "You mean the swimsuit." 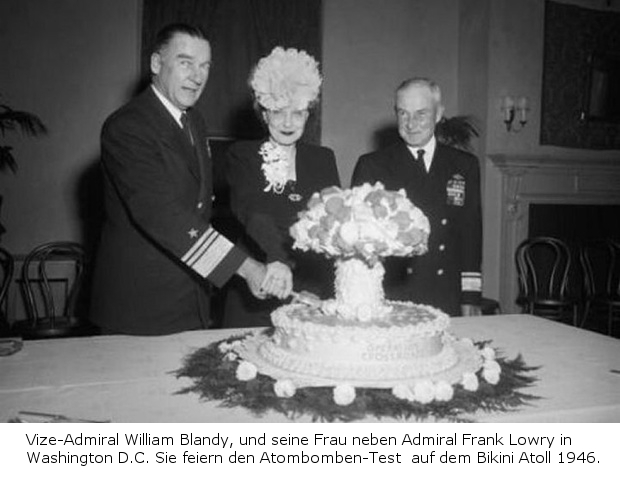 Few seem aware that the bikini swimsuit was named to celebrate the nuclear explosions that destroyed Bikini island. 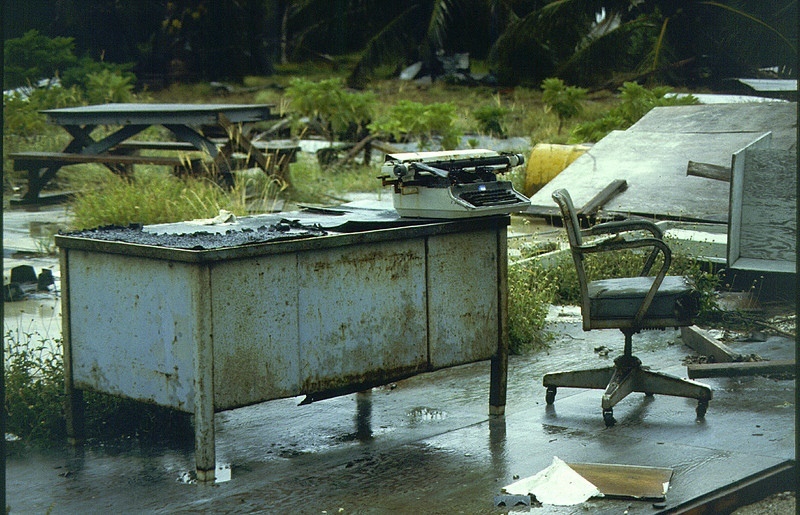 Sixty-six nuclear devices were exploded by the United States in the Marshall Islands between 1946 and 1958 -- the equivalent of 1.6 Hiroshima bombs every day for twelve years. Bikini is silent today, mutated and contaminated. Palm trees grow in a strange grid formation. Nothing moves. There are no birds. The headstones in the old cemetery are alive with radiation. My shoes registered "unsafe" on a Geiger counter. Standing on the beach, I watched the emerald green of the Pacific fall away into a vast black hole. This was the crater left by the hydrogen bomb they called "Bravo". The explosion poisoned people and their environment for hundreds of miles, perhaps forever. On my return journey, I stopped at Honolulu airport and noticed an American magazine called Women's Health. On the cover was a smiling woman in a bikini swimsuit, and the headline: "You, too, can have a bikini body." A few days earlier, in the Marshall Islands, I had interviewed women who had very different "bikini bodies"; each had suffered thyroid cancer and other life-threatening cancers. Unlike the smiling woman in the magazine, all of them were impoverished: the victims and guinea pigs of a rapacious superpower that is today more dangerous than ever. I relate this experience as a warning and to interrupt a distraction that has consumed so many of us. The founder of modern propaganda, Edward Bernays, described this phenomenon as "the conscious and intelligent manipulation of the habits and opinions" of democratic societies. He called it an "invisible government". In 2009, President Obama stood before an adoring crowd in the centre of Prague, in the heart of Europe. He pledged himself to make "the world free from nuclear weapons". People cheered and some cried. A torrent of platitudes flowed from the media. Obama was subsequently awarded the Nobel Peace Prize. It was all fake. He was lying. A mini nuclear bomb is planned. It is known as the B61 Model 12. There has never been anything like it. General James Cartwright, a former Vice Chairman of the Joint Chiefs of Staff, has said, "Going smaller [makes using this nuclear] weapon more thinkable." In the last eighteen months, the greatest build-up of military forces since World War Two -- led by the United States -- is taking place along Russia's western frontier. Not since Hitler invaded the Soviet Union have foreign troops presented such a demonstrable threat to Russia. Ukraine - once part of the Soviet Union - has become a CIA theme park. Having orchestrated a coup in Kiev, Washington effectively controls a regime that is next door and hostile to Russia: a regime rotten with Nazis, literally. Prominent parliamentary figures in Ukraine are the political descendants of the notorious OUN and UPA fascists. They openly praise Hitler and call for the persecution and expulsion of the Russian speaking minority. This is seldom news in the West, or it is inverted to suppress the truth. In Latvia, Lithuania and Estonia -- next door to Russia - the US military is deploying combat troops, tanks, heavy weapons. 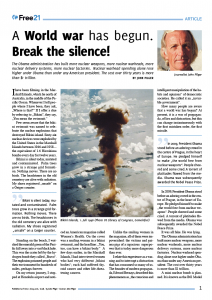 This extreme provocation of the world's second nuclear power is met with silence in the West. What makes the prospect of nuclear war even more dangerous is a parallel campaign against China. Seldom a day passes when China is not elevated to the status of a "threat". According to Admiral Harry Harris, the US Pacific commander, China is "building a great wall of sand in the South China Sea". What he is referring to is China building airstrips in the Spratly Islands, which are the subject of a dispute with the Philippines - a dispute without priority until Washington pressured and bribed the government in Manila and the Pentagon launched a propaganda campaign called "freedom of navigation". What does this really mean? It means freedom for American warships to patrol and dominate the coastal waters of China. Try to imagine the American reaction if Chinese warships did the same off the coast of California. I made a film called The War You Don't See, in which I interviewed distinguished journalists in America and Britain: reporters such as Dan Rather of CBS, Rageh Omar of the BBC, David Rose of the Observer. All of them said that had journalists and broadcasters done their job and questioned the propaganda that Saddam Hussein possessed weapons of mass destruction; had the lies of George W. Bush and Tony Blair not been amplified and echoed by journalists, the 2003 invasion of Iraq might not have happened, and hundreds of thousands of men, women and children would be alive today. The propaganda laying the ground for a war against Russia and/or China is no different in principle. To my knowledge, no journalist in the Western "mainstream" -- a Dan Rather equivalent, say --asks why China is building airstrips in the South China Sea. The answer ought to be glaringly obvious. The United States is encircling China with a network of bases, with ballistic missiles, battle groups, nuclear -armed bombers. This lethal arc extends from Australia to the islands of the Pacific, the Marianas and the Marshalls and Guam, to the Philippines, Thailand, Okinawa, Korea and across Eurasia to Afghanistan and India. America has hung a noose around the neck of China. This is not news. Silence by media; war by media. In 2015, in high secrecy, the US and Australia staged the biggest single air-sea military exercise in recent history, known as Talisman Sabre. Its aim was to rehearse an Air-Sea Battle Plan, blocking sea lanes, such as the Straits of Malacca and the Lombok Straits, that cut off China's access to oil, gas and other vital raw materials from the Middle East and Africa. In the circus known as the American presidential campaign, Donald Trump is being presented as a lunatic, a fascist. He is certainly odious; but he is also a media hate figure. That alone should arouse our scepticism. Trump's views on migration are grotesque, but no more grotesque than those of David Cameron. It is not Trump who is the Great Deporter from the United States, but the Nobel Peace Prize winner, Barack Obama. According to one prodigious liberal commentator, Trump is "unleashing the dark forces of violence" in the United States. Unleashing them? This is the country where toddlers shoot their mothers and the police wage a murderous war against black Americans. This is the country that has attacked and sought to overthrow more than 50 governments, many of them democracies, and bombed from Asia to the Middle East, causing the deaths and dispossession of millions of people. No country can equal this systemic record of violence. Most of America's wars (almost all of them against defenceless countries) have been launched not by Republican presidents but by liberal Democrats: Truman, Kennedy, Johnson, Carter, Clinton, Obama. In 1947, a series of National Security Council directives described the paramount aim of American foreign policy as "a world substantially made over in [America's] own image". The ideology was messianic Americanism. We were all Americans. Or else. Heretics would be converted, subverted, bribed, smeared or crushed. Donald Trump is a symptom of this, but he is also a maverick. He says the invasion of Iraq was a crime; he doesn't want to go to war with Russia and China. The danger to the rest of us is not Trump, but Hillary Clinton. She is no maverick. She embodies the resilience and violence of a system whose vaunted "exceptionalism" is totalitarian with an occasional liberal face. As presidential election day draws near, Clinton will be hailed as the first female president, regardless of her crimes and lies - just as Barack Obama was lauded as the first black president and liberals swallowed his nonsense about "hope". And the drool goes on. Described by the Guardian columnist Owen Jones as "funny, charming, with a coolness that eludes practically every other politician", Obama the other day sent drones to slaughter 150 people in Somalia. He kills people usually on Tuesdays, according to the New York Times, when he is handed a list of candidates for death by drone. So cool. In the 2008 presidential campaign, Hillary Clinton threatened to "totally obliterate" Iran with nuclear weapons. As Secretary of State under Obama, she participated in the overthrow of the democratic government of Honduras. Her contribution to the destruction of Libya in 2011 was almost gleeful. When the Libyan leader, Colonel Gaddafi, was publicly sodomised with a knife - a murder made possible by American logistics - Clinton gloated over his death: "We came, we saw, he died." One of Clinton's closest allies is Madeleine Albright, the former secretary of State, who has attacked young women for not supporting "Hillary". This is the same Madeleine Albright who infamously celebrated on TV the death of half a million Iraqi children as "worth it". Among Clinton's biggest backers are the Israel lobby and the arms companies that fuel the violence in the Middle East. She and her husband have received a fortune from Wall Street. And yet, she is about to be ordained the women's candidate, to see off the evil Trump, the official demon. Her supporters include distinguished feminists: the likes of Gloria Steinem in the US and Anne Summers in Australia. A generation ago, a post-modern cult now known as "identity politics" stopped many intelligent, liberal-minded people examining the causes and individuals they supported -- such as the fakery of Obama and Clinton; such as bogus progressive movements like Syriza in Greece, which betrayed the people of that country and allied with their enemies. Self absorption, a kind of "me-ism", became the new zeitgeist in privileged western societies and signaled the demise of great collective movements against war, social injustice, inequality, racism and sexism. Today, the long sleep may be over. The young are stirring again. Gradually. The thousands in Britain who supported Jeremy Corbyn as Labour leader are part of this awakening - as are those who rallied to support Senator Bernie Sanders. In Britain last week, Jeremy Corbyn's closest ally, his shadow treasurer John McDonnell, committed a Labour government to pay off the debts of piratical banks and, in effect, to continue so-called austerity. In the US, Bernie Sanders has promised to support Clinton if or when she's nominated. He, too, has voted for America's use of violence against countries when he thinks it's "right". He says Obama has done "a great job". In Australia, there is a kind of mortuary politics, in which tedious parliamentary games are played out in the media while refugees and Indigenous people are persecuted and inequality grows, along with the danger of war. The government of Malcolm Turnbull has just announced a so-called defence budget of $195 billion that is a drive to war. There was no debate. Silence. What has happened to the great tradition of popular direct action, unfettered to parties? Where is the courage, imagination and commitment required to begin the long journey to a better, just and peaceful world? Where are the dissidents in art, film, the theatre, literature? Where are those who will shatter the silence? Or do we wait until the first nuclear missile is fired? This is an edited version of an address by John Pilger at the University of Sydney, entitled A World War Has Begun. Next story Video: War or peace in Europe? Time to break the silence!